There’s something about Chicago. We lifers can feel it in our bones. It’s a pride tempered by humility. Yet plenty gritty. There’s not a trace of doubt in it. 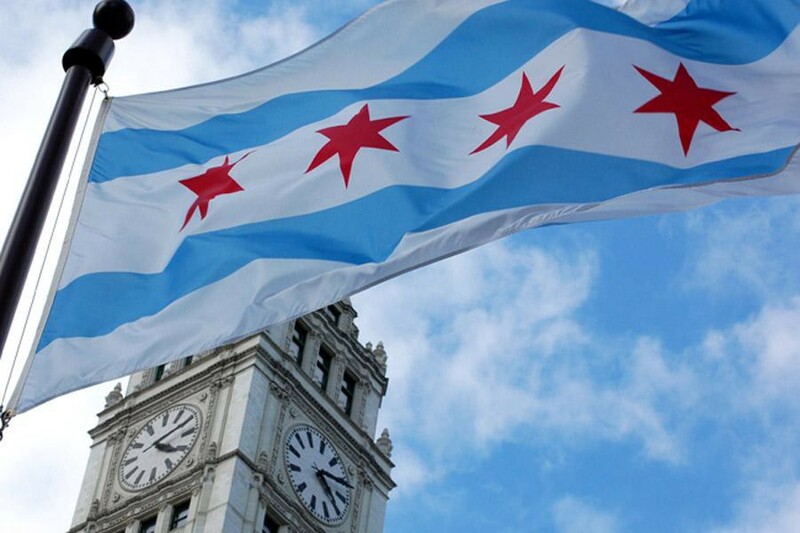 Chicagoans believe we live in the best city in America. At the same time, a whole lot of us know that our city sits at a perilous point in its history. More than a crossroad; a crucible. Chicago faces a set of seemingly intractable problems. Some new, but some as old as the city itself. Issues of race, segregation, violent crime and poverty. Issues driven by seminal events — extended over the decades by neglect and also by the sweeping of hard truths under the rug. Chicago is quietly haunted by its history. Far too quietly. The late Maya Angelou, who had her own friendship with Chicago, was fond of saying: “If you don’t know where you’ve come from, you don’t know where you’re going.” She may have nicked it from James Baldwin, but either way, it’s wisdom worth heeding. So let us take a good look. Chicagoans’ bold and hearty character derives from the city’s birth and speedy growth right from the start. In 1837, nearly 60 years after Jean Baptiste Point du Sable became the first non-Native American to settle in Chicago, the city was incorporated. Its population was 4,000. Not long after, the Chicago Board of Trade was established and the city became the world’s largest grain port. By 1857, its population had leapt to 30,000. A decade later, 109,000 people lived in Chicago. The city also revealed a remarkable sense of resiliency, re-booting itself time and time again from tragic events. In 1886, Chicago saw bloody clashes between labor protesters and police. It led to the Haymarket Riot where eight people died, seven of them cops. The city collectively recoiled, and accusations of which side was to blame flew back and forth between labor organizers and the police. 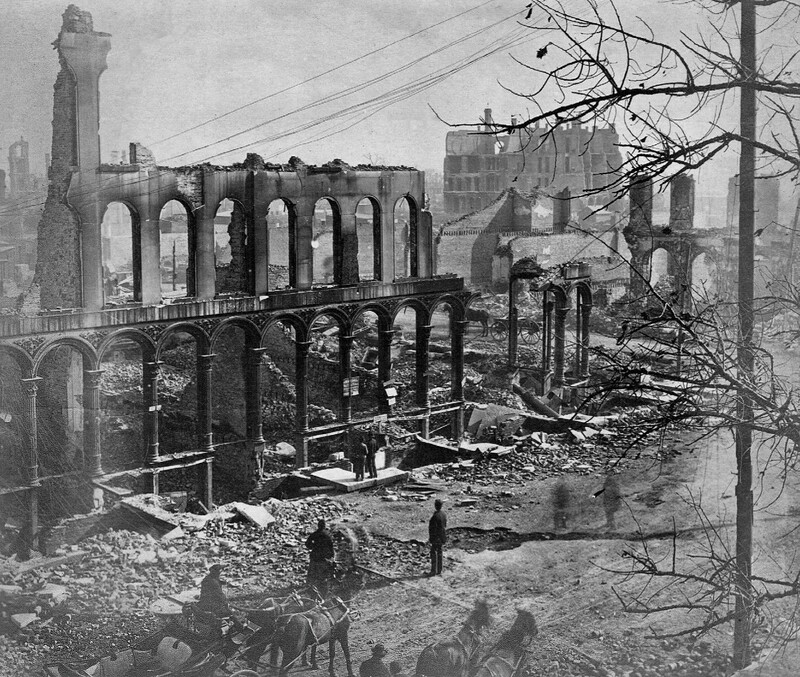 In 1871, more than 100,000 people lost their homes in the Great Chicago Fire. Three-hundred people died. Yet the city’s industries somehow survived. Chicago literally rose from the ashes and rebuilt itself with astonishing speed. Less than 10 years later, the city’s population eclipsed half a million. In 1871, 100,000 people saw their homes destroyed by the Great Chicago Fire. In 1893, Chicago hosted the World’s Columbian Exposition in Jackson Park. The city entertained more than 20 million visitors. By the turn of the century, a full 1.7 million people were calling Chicago home. It had established itself as a world class city, and it never looked back after that. 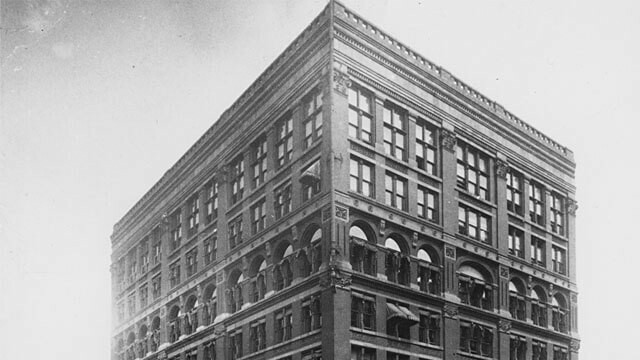 The world’s first skyscraper was the Home Insurance building erected in 1885 on Adams and LaSalle. And the city’s location as the connection point between the Great Lakes and more than a dozen rail lines elevated its status as America’s central transportation hub. The railroads enabled the delivery of prairie grain, timber up from Michigan and meat from the West. The famed Union Stockyards were born, and Chicago became the biggest meat-processing center in the world. It’s a towering history. Chicagoans I know will revel in this list — at the very same time they’re raking me over the coals for what I’ve missed. But that’s the point. A singular city has no shortage of hallmarks. Chi-Town is swimming in ‘em. Most of the descriptions above represent the happy history of Chicago; the charming and irresistible parts of the city’s character. But it leaves out the larger picture. The fuller truth. The reality is that some very ugly events and government policies in Chicago’s past, even recent past, have caused and sustained ripple effects that a great many Chicagoans still suffer from today. This July will mark 100 years since the Chicago Race Riots of 1919. Looking back, the riots seemed like an inevitability. Racial angst had been swelling for months following the end of the Great War. It all started on a hot summer day at the 29th Street beach. A 17 year-old African-American boy named Eugene Williams swam across an unofficial line in Lake Michigan separating blacks and whites. The whites reacted by stoning him. Eugene drowned to death. The pot had been boiling for some time. Whites had become embittered by the increasing number of African-Americans moving into their neighborhoods. In the two previous years, whites had bombed 26 black homes. When Eugene Williams was killed, it touched off a brutal street battle that lasted a week. And when it was over, 38 people had died, 25 of them black. More than 500 others were injured and nearly 1,000 black families lost their homes — set ablaze by rioters. 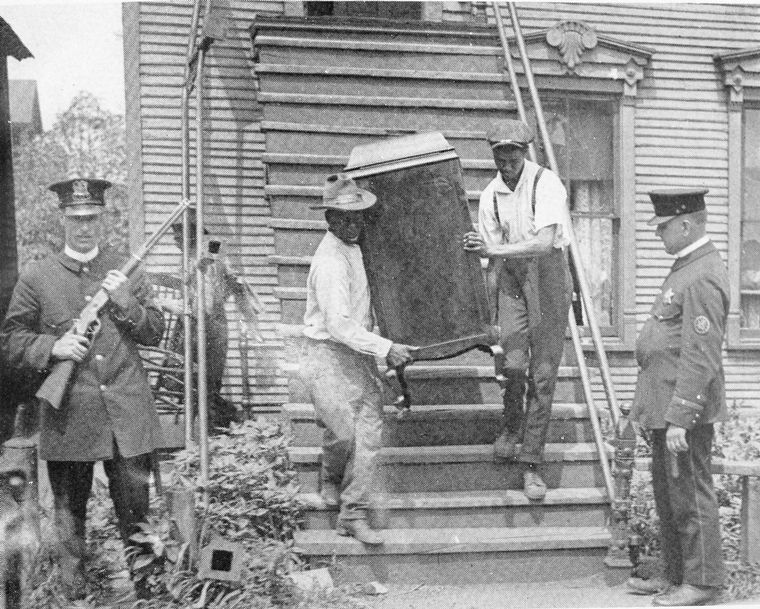 A family leaves their damaged South Side home during the 1919 Chicago Race Riots. Chicago was far from alone that year. Bloody race riots had erupted in 25 American cities in what came to be known as the “Red Summer.” But Washington D.C. and Chicago suffered the worst of it. When American soldiers, black and white, came back home, many hoped that the gains from the war would turn into a new era of increased racial integration. But it only got worse. Quarters in the Black Belt became more cramped, housing prices rose, and blacks were competing for jobs that the unions had traditionally held secure for whites — especially in the stockyards. “Racially restrictive covenants,” put simply, allowed property owners to make contractual agreements that disallowed racial groups from renting or buying housing. And in 1926, the Supreme Court upheld the practice in Corrigan v. Buckley. Ninety years ago, the Home Owners’ Loan Corporation (HOLC) and the Federal Home Loan Bank Board initiated the City Survey Program. While the program was ostensibly designed to provide stability for the real estate industry by calculating the risk of long-term home loans, what it turned into was a practice of appraising neighborhoods through a murky process substantially based on race. This federal policy was applied and used in many American cities. Chicago, already roiling in racial acrimony, became only more deeply segregated — and this would have real impacts in terms of what areas of the city would see resources and prosperity in the decades ahead. The Black Belt sustained itself until the late 1940s. When the High Court struck down restrictive covenants, blacks started migrating to other neighborhoods — and whites left. In 1955, Richard J. Daley became mayor and he ruled with an iron fist until his death in office in 1976. He ran a Democratic organization that could deliver 32,000 jobs to friends of the machine. That’s why they called it the machine. And Daley used this patronage, school board officials, and the construction of high-rise public housing to keep the city segregated. Despite urban planners’ assurances from that era, many Chicagoans are still firmly convinced that Daley’s construction of the Dan Ryan Expressway was an effort to keep the divide between white and black neighborhoods. When Daley was 17, during the 1919 riots, he was a member of the Hamburg Athletic Club. The “Hamburgs” were one of the gangs that instigated the race riots, according to an investigation by the Chicago Commission on Race Relations. Daley always denied having anything to do with it. A few years after the riots he was elected President of Hamburg. Not quite history rhyming, but it’s in the ballpark. 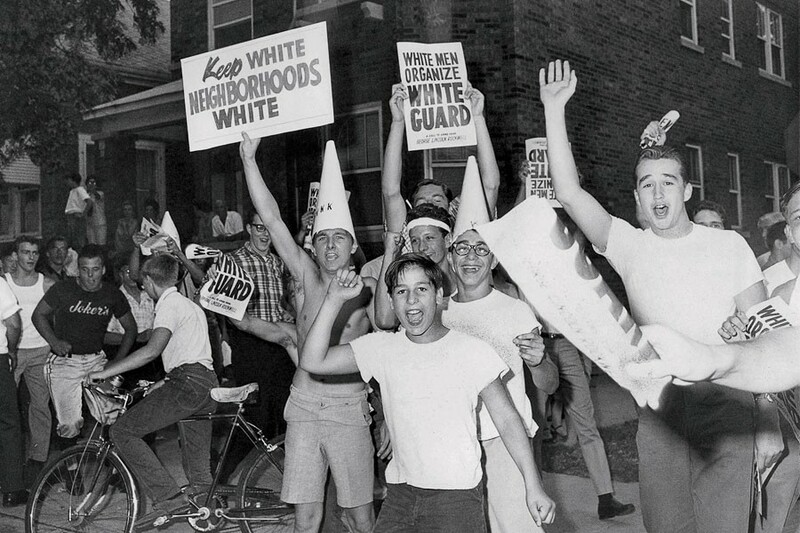 After the Daley years, some of the gains of the Civil Rights movement began to take hold. The Fair Housing Act of 1968 outlawed redlining. The Black Belt had started expanding, as families were rapidly planting new roots in neighborhoods across the West and South Sides of the city. And that’s when “white flight” in Chicago really began to ramp up. In 1960, the white population in the Englewood neighborhood was 51,583. According to a study by the Chicago Reporter, by 1980 there were just over 800 whites left. In 2013, out of the 28 neighborhoods where blacks made up the majority, nearly all of them had less than 2% white residents. Over recent decades, Chicago would see more of its white residents move out to the suburbs. Through five more mayors, including Richard M. Daley, the son, who served for 22 years, segregation dipped a bit, but not enough to register in any real ways. Based on the last US Census taken in 2010, a Brown University study classified Chicago as the #1 segregated city between black and white, #6 between Latinx and white, and #2 between blacks and Latinx. In 1966, Dr. Martin Luther King led marches through Gage Park and Marquette Park as part of the Chicago Freedom Movement. King met with Mayor Richard J. and received concessions on housing reforms. Daley delivered on none of it. In 1966, counterprotesters in Chicago line part of the route taken by Dr. Mr. Luther King Jr. in the Chicago Freedom Movement March. Fifty years later, we know it’s all still true. While Chicago’s population is evenly split between blacks, whites and Latinx, deep inequities are reflected within and because of our city’s segregated communities. “When applying for conventional loans in the Chicago metro area, whites have a 77% approval rate, Latinxs have a 67% rate, and blacks have a 59% rate. Standing at nearly 20% today, the black unemployment rate is over four times the city’s white unemployment rate. The unemployment rate for Chicago’s Latinxs is about 10% or about double the white rate. Whereas the typical white family earned 1.6 and 1.4 times more income than the typical black and Latinx family in 1960, today the typical white family earns 2.2 and 1.7 times more income than the typical black and Latinx families. CPS schools are segregated by race and ethnicity as well as poverty. About 91% of black students and 89% of Latinx students attend schools where 75% or more of the student population are eligible for free or reduced lunch. Blacks and Latinxs are more likely to be searched during vehicular stops. Although blacks and Latinx are searched at four times the rate of their white counterparts, they are half as likely to be in possession of illegal contraband or a controlled substance. Only 14 out of 100 CPS 9th graders graduate college within ten years of beginning high school. Of these college graduates, 36% are white women, 27% are white men, 16% are Latinx women, 13% are black women, 11% are Latino men, and 6% are black men. These are just a few of the key findings published in the UIC study. And while not every single statistic can be fully ascribed to Chicago’s segregated neighborhoods, we know that plenty of them can. Cycles of poverty and violence are not unique to Chicago, but they are pervasive and persistent in the Windy City. We use the word “cycle” to describe this kind of system where increasingly negative conditions drive negative consequences — and then sustain those very same conditions. And like any entity or system, the fewer resources that are invested in it, the lower the chances for improvement or success. This concept is not complex. Lack of jobs and opportunity stems from lack of investments in education, social infrastructure and business development. Examples abound. The kids in Chicago who need free meals at school are overwhelmingly minority. The quality of CPS teachers in our schools corresponds highly to the number of black and brown students who attend those schools. Fewer high school diplomas leads to fewer young adults who are prepared for employment. All of these factors have an impact on the number of dollars — both from City Hall and from the business community — that are invested in South and West Side neighborhoods. It’s a meager sum compared to the resources dedicated to the downtown and North Side. This is the cycle. And it leads to violent consequences. The neighborhoods where the most gang and criminal activity take place cluster up on a map as if pulled by a magnet. Chicago’s 10 neighborhoods where the most shooting murders occur include: West Garfield Park, North Lawndale, Englewood, Riverdale, Avalon Park, Austin, West Pullman, East Garfield Park, Roseland, and South Shore. All of these neighborhoods are more than 90% African-American; several of them 99%. And while every single one of these communities is vibrant in its own way and each has residents who are constantly working to lift their neighborhood up, there is no getting around the fact that it’s a steep incline to climb. And segregation still lies at the heart of it. 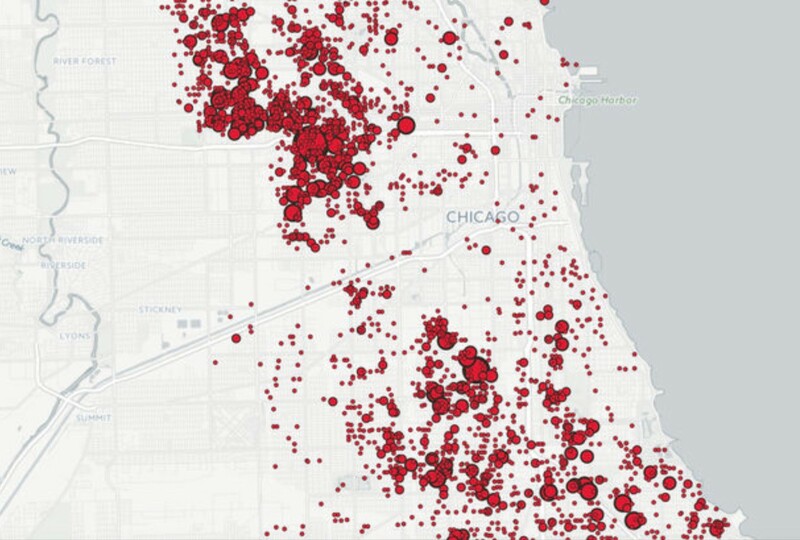 The shootings of Chicago, block by block, mapped by DNAinfo. 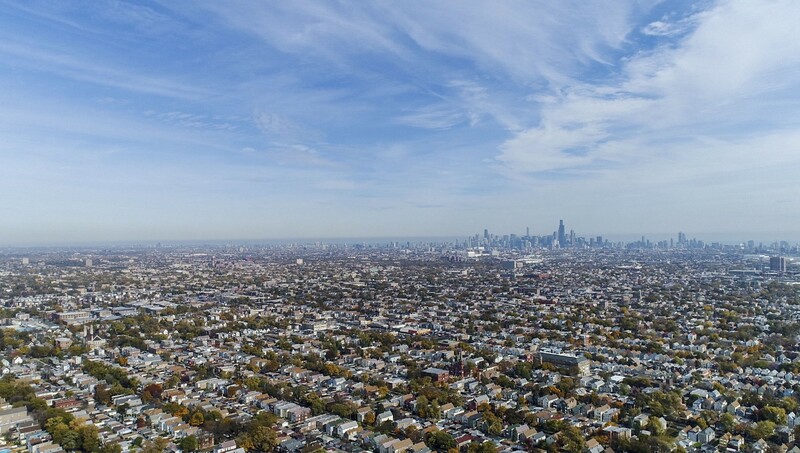 Working in conjunction with the Chicago Metropolitan Planning Council, the Institute analyzed the 100 most highly populated metropolitan areas and measured their levels of segregation against various quality-of-life and economic outcomes. The study, released in 2017, gamed out what would be the case if Chicago’s black/white segregation was equal to the median level of segregation in those 100 cities. Among their findings, the authors concluded that African-Americans would increase their incomes by at least 12% and Chicago’s homicide rate would drop by 30%. Then they broadened their perspective and looked at the damage that segregation was inflicting on the entire city: Chicago loses $4 billion in income and more than 80,000 college degrees per year. 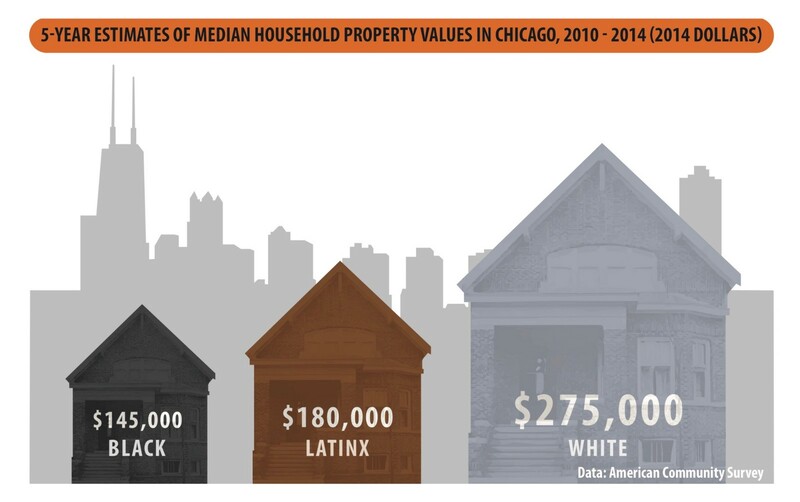 The authors also estimated that if Chicago would have been able to reduce its segregation level back in 2010 to the median level, home values would have increased by $6 billion and the city would have saved more than $280 million in costs swallowed up by policing and incarceration. These are nice outcomes to think about. They’ll also never happen until Chicago confronts the root causes head-on. 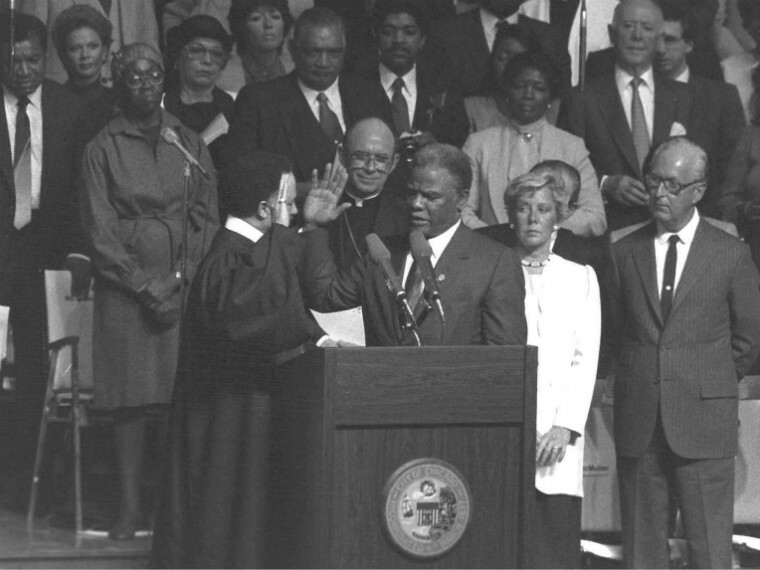 Moore finished her article by recalling the days of Chicago’s first African-American mayor, Harold Washington, and what he accomplished despite the racially charged “Council Wars” where the white majority automatically opposed him on nearly all of his priorities between 1983–1986. Washington died in office in ’87, but not before he ultimately created a multi-ethnic political coalition and made substantial efforts to balance the inequities he knew all too well. In fact, Washington had attended racially segregated DuSable High School in the 1920s. 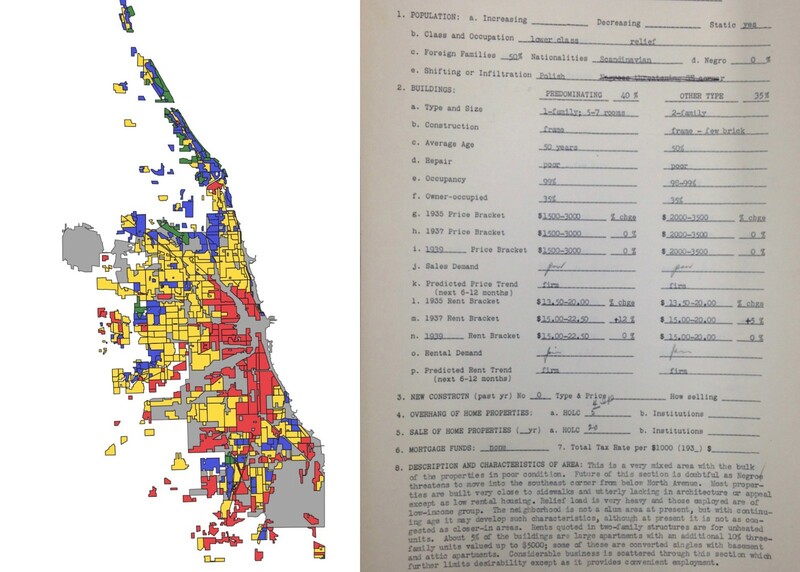 Segregation is an enormously consequential part of Chicago’s past. And its present. The policies that sustain it — and the inequities resulting from it — may seem more subtle or innocuous than the overt racism we saw for so long in American government. But in a way, that makes it almost more dangerous. An example of this is modern day redlining which continues in the form of African-Americans and Latinxs being denied mortgage loans far more frequently than whites — even after income, loan amount and neighborhood are factored in. According to the The Center for Investigating Reporting, this discrimination is still happening in 61 Chicago communities — half a century after the passage of the Fair Housing Act. The Association has created a Diversity Committee to report and discuss discriminatory practices — and eliminate them. That’s a nice step for Chicago. But large scale changes in society don’t happen unless and until public movements push for change. We do that with our votes and our voices. Chicago is about to hold an open-seat mayoral election — the most watched in decades — with 14 candidates on the ballot. Black candidates. White candidates. Hispanic candidates. Male and female candidates. The youngest candidate is 30 years old. The most senior is 70. The candidates have plenty of differences in how they’ve proposed to handle the central issues that most Chicago voters say they care about: public education, taxes, ethics reform, police reform, gun violence, infrastructure, etc. As well, many of the candidates have laid out plans on how they would invest in the long-neglected neighborhoods referenced above. Good. That is all to be expected in a mayoral campaign. But voters may want to ask themselves a question before casting their ballots: Who among the 14 candidates have spoken publicly about the actual causes of Chicago’s biggest problems? Who’s been straight about our history? Who has worked with diverse coalitions in past leadership posts to produce meaningful results for underserved communities? Who doesn’t just talk about bringing the city together, but can also walk the walk? There are only a few who can check off all of these boxes. Chicago voters should seek them out, learn about them, and then choose carefully. The city is about to elect a new mayor to what is arguably the toughest mayoralty in the country. Whomever makes it to the famed Fifth Floor of City Hall will have to prescribe some pretty powerful medicine to heal and strengthen Chicago — but it all starts with a totally honest diagnosis of the underlying disease. The time is long past due for Chicago to face up to it. All of it. Once it does, the city’s potential will be limitless.